DeckLok® Advanced Lateral Anchor System - DeckLok Deck Bracket System by Screw Products, Inc.DeckLok Deck Bracket System by Screw Products, Inc. Available in post-manufactured, hot-dip galvanized and 316 stainless steel, DeckLok® helps you exceed IRC and IBC 2006, 2009 and 2012 code requirements. 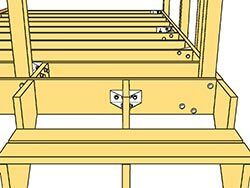 DeckLok provides a bolted connection between the guard railing post and the floor joists of the deck. IBC Code requires the guard rail post to resist a force of 500lbs at a point 36" above the surface of the deck. DeckLok does this! Mounting the DeckLok lateral anchors directly to the base of the rail post, or to the deck board, creates a solid mounting surface while still using traditional construction techniques. Independent laboratory testing confirms that the DeckLok System increases guard rail lateral load capacity by 4 times the current capacity. - read more about using DeckLok on your railposts. Decklok provides a stronger connection for stair stringers by creating a bolted connection to the deck frame. DeckLok augments the current method of attachment of stair stringers to the deck. DeckLok Lateral Anchor's design and placement adds rigidity and strength by creating a bolted connection to the deck band board and floor joists. The patented design ensures a more secure attachment between these deck components, reducing the possibility of structural failure and collapse. - read more about using DeckLok on your Stair Stringers. Decklok is a patented product that provides a bolt-on connection between your house and your sun deck. 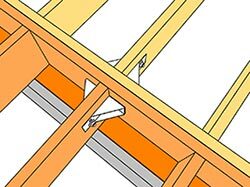 It stops catastrophic failure of decks by attaching directly to the house’s floor joist! 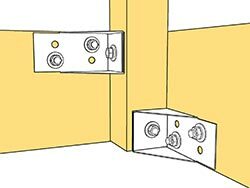 Note: The International Residential Code (IRC) now requires the connection to the structure to be designed for both vertical and lateral load. DeckLok does this! Current building code requires decks to be bolted to the band or rim board of the house. However, the band board was never designed to support another structure such as a deck or sunroom!- read more about using DeckLok on your ledgers.